How Many Drafts Should I Write? I remember when I first came across the concept of writing in drafts. I was in primary school doing some piece of written work (I forget what about) when my teacher told us all to write a rough draft first, then to write a second draft. Well that’s just silly, I thought (I couldn’t have been more than seven years old). Why don’t I just write it properly the first time? Because, as Ernest Hemingway (one of the greatest writers of the modern age) pointed out, ‘the first draft of anything is s***’. Now if Ernest Hemingway couldn’t knock out a high quality novel on the first go, what chance have the rest of us got? Ah, well, now you’re asking. The short and somewhat glib answer is, ‘as many as it takes’. In my experience, three would be the bare minimum but no two writers work in quite the same way so if you’re looking for a hard and fast rule, look elsewhere because I ain’t got one to give you. I can only give you the benefit of my limited experience. So, this is what works for me. Feel free to try it out and if it doesn’t work for you, well… don’t shout at me. Before I even attempt to write a first draft, I write a zero draft. ‘Well, that just sounds like a load of pretentious nonsense to me!’ I hear you cry. Well a lot of writers of both fiction and non-fiction use zero drafts and I don’t know whether or not they use the term in exactly the same way I do, but for me a zero draft sits somewhere between free-writing and drafting. I’ll write maybe half a dozen (often more) of these individual, disjointed portions of narrative, without worrying too much about whether it’s any good or not, to help me invent settings, audition characters and generally breathe a bit of life into my ideas and research without worrying about if they will fit into my final project. 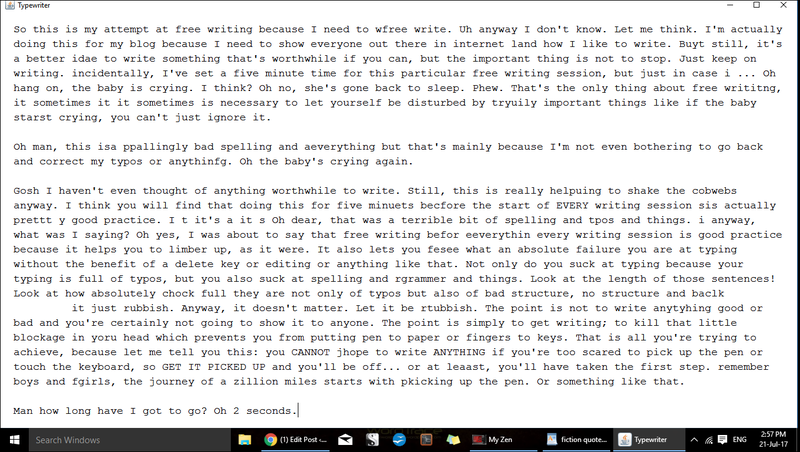 This kind of writing is not structured enough to be considered a true first draft but it is more focused than free-writing, which simply involves typing whatever comes into your head even if it’s nothing to do with anything (click here for an example of what free-writing looks like). Not all writers use zero drafts. They work well for me because, as a half-planner/half-pantser, I need a chapter outline to help me write a draft… but I can’t easily imagine what my characters might do and think unless I’ve already written them into existence. Thus I write a zero draft to help me plan. Then I use the plan to help me write my first draft. This is where I make my first serious attempt at writing my novel/novella/short story/etc in all its fullness. After I’ve completed my chapter outline, story beats, character profiles and all that boring stuff, I should have a pretty clear idea in my mind as to what events should happen and in what order. I know where my story begins, where it ends and the journey it takes to get there. All I have to do is write it, starting with chapter one and ending with the ending. What I don’t worry about at this stage is my writing style: word choice, figurative language, or even more basic things spelling and grammar. I try to stick to a rough word count, but even then, I don’t let it hinder me. The point of this stage is simply to get the story out in all its fullness, no matter how badly written it may be. Or, as Terry Pratchett put it, ‘the first draft is just you telling yourself the story’. Write it quickly. Don’t edit it. It can be rubbish, as long as it’s complete (note: it should still make sense, however, assuming you’ve done the planning bit properly!). Congratulations! You’ve completed your first draft. Now go away and do something else for a few days at least. Done that? Alright, now print off your first draft and read it with a dispassionate eye. Rubbish right? That’s okay, it’s meant to be. At this stage, I grab my red pen and go through the whole thing picking out everything in the story itself that needs fixing or improving. Shallow characters, unconvincing dialogue, plot holes (though there shouldn’t be too many of those if I planned well in the beginning) and all that sort of stuff. I still don’t waste too much time at this stage thinking about language or style; what matters is the plot, the people and the places that make up my story. Once I’ve worked out everything that needs improved, it’s time to start writing that second draft, slower this time, taking care to apply all the improvements I’ve decided to make. Note: by ‘writing that second draft’ I do mean writing the whole story all over again from scratch, not simply tidying up the first draft. Keep the first draft safe so you can refer back to it. For me, this is the final essential stage of drafting any story I write, although it is entirely possible that I might need to write more if my first ones weren’t up to scratch. Once I’ve completed my second draft I again set it aside for a little. This time when I come back, I print it off and, using my Red Pen of Editing, go through it with a fine tooth comb working out all stylistic issues. This is without a doubt the slowest draft to create. Every word counts, every sentence matters. By now, I should be fully satisfied with my story (if I’m not, I need to go back and repeat an earlier stage) and am focused purely on turning my story into a work of art. Word choice, turns of phrase, figurative language and all those other subtle things that turns a story into something beautiful. What you’re trying to say should already be well and truly established. For me, the third draft is all about how you say it. While every effort has been taken to avoid spoilers in this post, anyone who has not read Of Mice and Men by John Steinbeck or seen the Doctor Who (2017) episode ‘World Enough and Time/The Doctor Falls’ is hereby advised that this post may contain a few unavoidable spoilers. Don’t you just hate endings? For me, they’re one of the hardest bits of the story to write, but they’re also one of the most important. Your audience will (usually) put up with a fair amount of uncertainty in the middle of a story but by the time they reach the end, they want their ‘i’s dotted, their ‘t’s crossed and all their questions answered. And who can blame them? They’ve devoted a considerable portion of their valuable time to reading/watching/listening to your story. The least we owe them is a good ending that doesn’t leave them scratching their heads (or worse, venting their hatred for you on Twitter). And so, it is my pleasure to present you with a whistle stop tour of the pros and cons of five common ways to end a story. Let’s begin with the classic. It’s been a rough old ride but evil has finally been vanquished, the hero has married the love interest and all is right with the world. In short, the story is over. There is nothing left but a fuzzy feeling that our heroes will now live forever in a kind of literary heaven where nothing ever goes wrong for them. Pros: It leaves the audience feeling good about the fact that all conflicts have been resolved and all questions answered. The story is undeniably finished and the audience can get on with their own lives. Cons: It’s not terribly true to life. I can’t think of a single instance in my life, nor the life of anyone I know, where all problems have been resolved in one neat little package leaving not a single cloud on the horizon. It also downplays the significance of any tragedies that have occurred during the story (unless of course your protagonist has lost nothing throughout the story… in which case, I’m afraid you’ve written a guff story). Word of Warning: ‘Happily ever after’ is the most implausibly clean cut way I know of for a good writer to end a story, so beware you don’t accidentally leave some questions unanswered. Sure, your bad guy has fallen into his own pool of sharks but… what about his armies of darkness, for example? If they really believed in their Leader’s cause, is the world really safe? This ‘ending’ (I use the word loosely), involves deliberately leaving unanswered questions. The story is not completely over. Evil is not quite vanquished forever. A sequel is certain to follow. Pros: If you’ve done your job right, you’ll probably find your sequel will fly off the shelves a heck of a lot quicker than the first instalment did. Cons: It runs the risk of also having the opposite effect if your audience wasn’t completely in love with your story. Remember, sequels cost money to buy and time to consume. If they feel like your first instalment was a waste of time and money, they might not want to put themselves through the same ordeal again. I’ve left many a series unfinished because the first book left me feeling underwhelmed. Word of Warning: Whether you wrote a wonderful story or a terrible one, your audience won’t thank you for an ending that’s all cliffhanger and nothing else. The first instalment of a series should still be a complete instalment. While danger may yet loom on the horizon, hinting at the sequel to come, this instalment is finished. Be sure to complete your narrative and character arcs to give your reader a sense of satisfaction. This ending focuses more on drawing your central theme or moral to a conclusion, rather than the events themselves. Such endings can involve the protagonist succeeding in their goals, failing in their goals or something else entirely. The point is not so much what happens as what is learned. Pros: It’s truer to life than most endings, insofar as in real life, one event always leads to another without a neat ending (even deaths lead to funerals, lawyers meetings, grief and the buying/selling of property). It can also leave your readers pondering your story for months. Cons: It’s not easy to pull off. If you don’t pack a strong enough punch with it, your readers will feel like the story is unfinished and they’ve been left with nothing but a glib moral platitude. Word of Warning: This one’s not for you, genre fiction. Literary fiction might just get away with it, if the author is skilled enough, but genre fiction tends to be far too reliant on questions such as ‘will good triumph over evil?’, ‘will the hero get the love interest?’, and generally ‘however will they get out of this pickle?’. Just when it seems like all is lost and there is no chance for good to triumph over evil… BOOM! God appears and makes everything better, or the protagonist wakes up and it was all just a bad dream or the water lady from the first episode shows up out of the blue and saves the day with Moffat Magic. This is the ending for the writer who wants a ‘happily ever after’ ending, but can’t be annoyed fixing all the problems in his or her narrative that make a happy ending impossible. Pros: It’s easy to do. Just add magic. Cons: Instead of resolving the problems and answering the questions that make the story worth reading/watching/listening to, all you’ve done is shrugged them off. It’s bad writing and it will make your audience hate you. Sometimes a happy ending just isn’t what you want at all. In John Steinbeck’s Of Mice and Men, the two protagonists (Lennie and George) had big plans to set up their own ranch one day. However, in the end, George is forced to shoot Lennie in order to save him the more arduous death he was about to suffer at the hands of a lynch mob. The story ends with the death of one protagonist, and the other has survived only to be consumed (presumably) with regret over his actions and the unravelling of his dream. Pros: It’s good for creating feels and driving your central theme/moral home in a powerful way. Cons: Sad endings, by definition, must leave your audience feeling a bit sad. If your audience cares about your protagonists (and they should), they’ll probably have been hoping that they would achieve at least some of their goals. Word of Warning: In the right hands, a sad ending can be profound. Of Mice and Men is one of my favourite novels. But in the wrong hands, it can be an extra-terrible form of deus ex machina, in that it resolves problems simply by sweeping them aside, only without the warm fuzzy feeling you get with a happy ending. At least the last series of Doctor Who ended with a happy deus ex machina ending but for goodness sake, don’t kill everybody just for effect. Thanks for taking the time to read this post. Be sure to leave us a wee comment if you enjoyed it and don’t forget to ‘like’ this post and follow us so you never miss another post. You can also follow Penstricken on Twitter and like Penstricken on Facebook, if that’s what lights your fire.